We’ve updated our map to make it easier to navigate 10 dozen active sites and projects the Reporters’ Lab is monitoring around the world. The 2016 U.S. election has involved a slew of misstatements from both presidential candidates, with no shortage of Pinocchios, “whoppers,” flip-flops and other “lowlights.” And that will certainly continue long after the ballots are officially counted. More than 50 fact-checkers across the United States helped voters sort facts from fibs in this campaign year. With 2017 looking like another big year for truthiness and misstatements, the Duke Reporters’ Lab is rolling out some improvements on the global map we use to track this important journalism. Based on our current count, fact-checkers are already on the job in at least 10 countries where voters will be casting ballots in the coming year, including Argentina, Chile, Czech Republic, France, India, Kenya, Netherlands, Senegal, Serbia and South Korea. 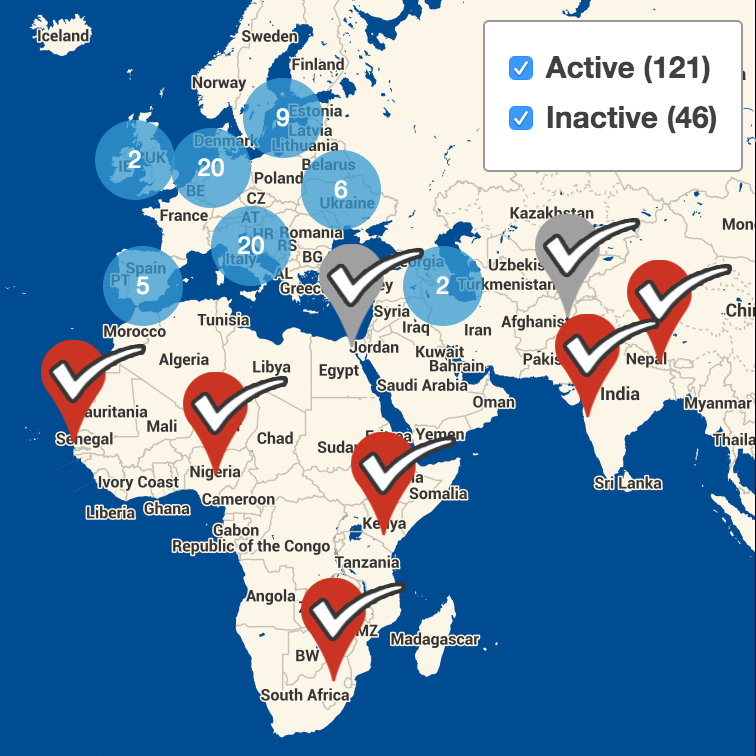 Overall, we currently count 119 active fact-checkers in 44 countries. And there are multiple fact-checkers working in 12 countries. Because fact-checking is concentrated in many cities, making the checkmarks on our map overlap, we’ve added a clustering feature that will help users find and navigate the places where we have listed multiple teams. The map now distinguishes the active fact-checkers (shown with red pins) from the more than 40 others that have closed for one reason or another (they’re indicated by gray pins). The map also has an up-to-date tally of both the active and inactive projects. You can click on that box to look at one category or the other. Country-by-country lists, including a tally of active projects, are available with the “Browse in List” link (find it to the right of the map). We regularly add new fact-checkers and review the status of older ones, so our tally sometimes goes up and down. We know from past years that some U.S. fact-checkers will close for the “off-season” and the same is true in other countries. We’re always on the lookout for fact-checkers, including those that look at issues other than politics. One example is New York-based Gossip Cop — a recent addition to our database that’s been debunking celebrity rumors since 2009. Other recent additions include US. fact-checkers at the Cincinnati Enquirer in Ohio and the University of Wisconsin in Madison. We also added or reactivated four others that came out of hibernation for the election. International additions include established projects in Denmark, France and Japan, and newer initiatives in Kenya and Lithuania.